We will post photos to our website from the DC area! Reports of many Montgomery County emergency vehicles getting stuck are coming into our news center. Please drive cautiously. It is likely if you require an emergency service that the wait time will be significant. Please be cautious. Extremely hazardous road conditions exist on area roads at this time. Multiple fire units are responding to numerous accidents across the capital region. Local officials advise everyone who does not need to be on the roads to stay off the roads! LIVE blogging will continue right here on The Capital Region Pulse! Please use extreme caution when driving around tonight. Heavy snow is occurring over most of the area (exception is east of I-95). 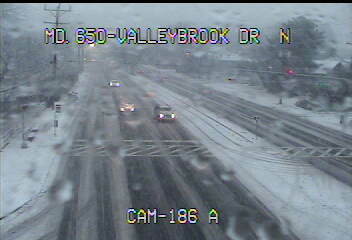 Roads are quickly becoming snow covered and dangerous. Many accidents have been reported. Sleet has begun to changeover to all snow here in Silver Spring, MD. There have been reports of very heavy snow just to the southwest of the area. All of this activity is now expected to continue into the evening. Heavy accumulations of 4 to 8 inches are expected. Follow us on Twitter @CapitalRegPulse and visit our Facebook page to never miss an update! We will begin posting photos from Silver Spring in the next few updates. Thunder and lightning have been reported in parts of Fairfax County, VA! Sleet and rain will quickly change to snow and become heavy at times as bands of heavy precipitation develop and move through the area. Expect snowfall rates of 1-2 inches per hour at times into the evening hours. Latest data indicates peak snowfall period may only be 6 hours long but heavy accumulations expected during that time. The evening commute is expected to be extremely dangerous across the area. Please drive carefully and watch all vehicles around you. Obey traffic laws and stay alert. Storm total accumulations in the heaviest bands should be from 5-10 inches with a general 4-8 inch total elsewhere. We are currently expecting numerous school delays/closures tomorrow so stay with The Capital Region Pulse for the latest information! Weather conditions will rapidly deteriorate across the Washington area within the next one to two hours. Heavy snowfall with rates possibly reaching two inches per hours will become probable. A Winter Storm Warning remains in effect into tonight for the potential of major snowfall accumulations. It is possible that the snow may start as sleet or rain for a short period before changing to all snow. Residents should be prepared for possible hazardous road conditions this afternoon and evening. Keep in mind that the federal government has allowed a two hour early closing. Heavy bands of precipitation can be seen moving up from the south. With a Winter Storm Warning in place across the metro area, the region is preparing for a significant winter storm. Reports of heavy snowfall are already coming out of parts of Virginia, and these dynamics are expected to move into the Washington area as the afternoon progresses. The Capital Region Pulse weather team is currently forecasting between five and nine inches of snow for the area...some higher totals will be possible in the heaviest bands. Thundersnow will be possible with incredible snowfall rates during the heart of the storm. Don't be surprised if roads QUICKLY become impassable and extremely hazardous. We will continue to have the latest information as it becomes available! The afternoon models are running right now and they seem to be holding onto the idea of significant snow for the Washington area tomorrow afternoon into tomorrow evening. The 18z NAM model clearly shows some significant energy on the 500mb map. For the lay people reading this posting - the 500mb level is high in the atmosphere, and maps from this part of the atmosphere are useful in diagnosing where certain features are. 500mb level map from the 18z NAM model. Strong indicator of the potential of snow in our area. This map would indicate a strong chance for snow in our area - more later. The National Weather Service has issued a *Winter Storm Watch* for tomorrow afternoon into tomorrow night. Snowfall accumulations of five or more inches are possible with this winter storm. Well folks, say hello to winter again! It currently appears as though a significant winter storm is heading for the Washington area for tomorrow afternoon and tomorrow night. Latest computer models suggest the potential for greater than 5 inches of snow in parts of the area! Some of the computer guidance indicates a chance at even more as well! LIVE winter storm coverage will begin on our Livestream channel at 8:00pm EST tonight. We will continue to post updates to our Twitter page, and Facebook page as well. Beginning during the day tomorrow, we will begin live blogging on this website as well. Tune in for the latest winter storm information!